I'm so happy to finish my April block, for the Free Bee. I was a month behind..... for some strange reason I made the May blocks before the April block. I plead crazy creative mood swings....or something like that. I hope you like it Ethne. I'm finding this book quite fascinating. After giving it a more thorough read, I went down to play. Pressing creases into the arc is a very fast and easy way to mark the fabric. I would much rather chain piece than paper piece any day of the week. That was actually quite effortless! I love trying new techniques...and this one is a keeper. The light weight of the shot cottons is especially nice for this particular method. Let me explain......in the aftermath of a "Creative Frenzy" the doldrums hit. I'm sure you know what I'm talking about. After spending weeks immersed in a project, to the point of obsession, at times, one is left feeling a little lack luster, when all is said and done. A little shop hop was in order. Climbing into fellow quilter's car she casually (well, not all that casually) mentions, that one of our favourite shops is moving....and you know what that means, deals are to be had. 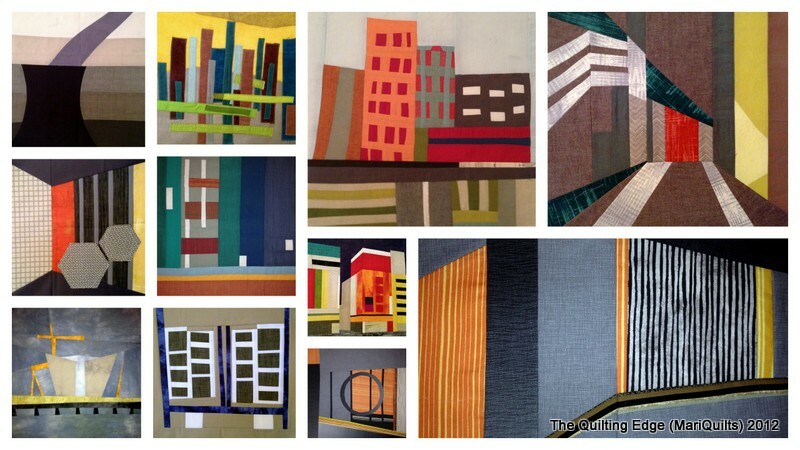 The author, of this particular sale, is ingenious...I mean she knows us quilters. The more you buy the greater percentage you save.....who does that to a fabric junkie??? Does that even look like 58 meters??? Notice, I'm being very restrained in my choices...if not in my amounts. The majority of the yardage I bought is somewhat neutral with lovely texture and of course a few funky prints, thrown in for good measure. After all, there has to be some sort of restraint when buying in such an uncontrolled manner. I know, it's a bit like going on a chocolate binge, only much more expensive.....hmm, chocolate sounds good, right about now. Last but not least, I casually threw this book, on top of my pile....I'm a bit of a book junkie as well. My plan was to take a quick browse, before I headed off for bed, last night.....well I was still up at 4:30 am, with all kinds of creativity rattling around my brain. I quickly made a little test sample.........I think I feel another "Creative Frenzy" coming on. I'll keep you posted. 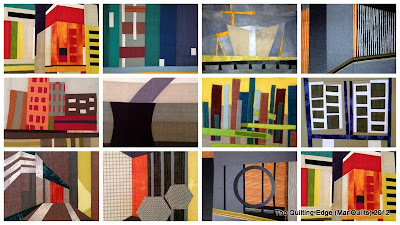 Can you believe it, another Bloggers' Quilt Festival is underway. 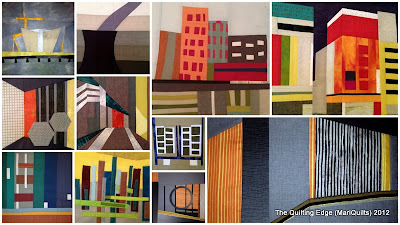 You'll want to check this out, as so many bloggers enter their amazing quilts, in the festival. It's a wonderful feast for the eyes and a terrific opportunity to be introduced to more quilter's and their fabulous blogs...what could be more exciting than that. I finished Colour Shot, just in the nick of time to enter it in the festival. Why did I start this quilt....Lynne asked if I would be willing to make a quilt using the Oakshott Cottons and blog about it??? Would I be willing???? Well of course, I'd be willing. When this beautiful bundle of Oakshott Cottons arrived at my door, mid March, I became totally obsessed with immersed in this project. I've flooded my blog with my progress, over the last few months and have been motivated, by so many supportive comments along the way. This is the first totally solid quilt I've ever made, but I don't think it will be my last. A lovely day for a photo shoot of Colour Shot. The Oakshott Project is complete. I'm kind of sad I'm finished...we've had so much fun together these lovely Oakshott Cottons and I. But no worries, we'll be friends for life.....that just means more Oakshott Projects. I had enough questions regarding the corners of machine stitched binding, that I quickly put together a sample. In my earlier post, I was doing a reversible binding so there were no mitered corners. Below is a sample of regular binding with mitered corners. I just grabbed one of my samples and did a quick corner. My preference is a two and one half inch binding. Here it is folded in half and sewn to the front of the quilt, using a quarter inch seam allowance. I won't go into all of the details in applying bindings here. Press the binding away from the edge. take time to press the mitered corners. Pressed corner from the front. Pressed corner from the back. You are now ready to start stitching. I use a walking foot for the whole binding procedure. 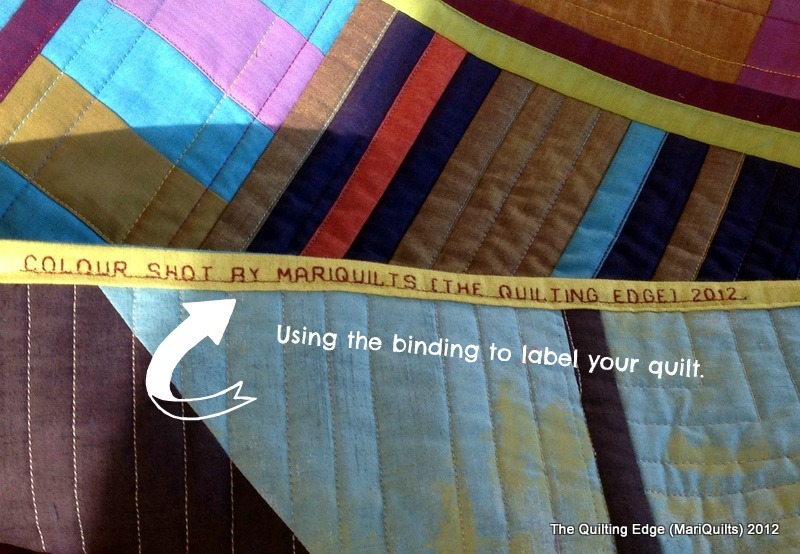 Make sure to match the upper thread as closely as possible, to the front of the quilt. I didn't do this, so you could see the thread a little better. Match your bobbin thread to your binding, again I didn't do this purposely for this sample. Start with a very short stitch length and then set to about 3mm. 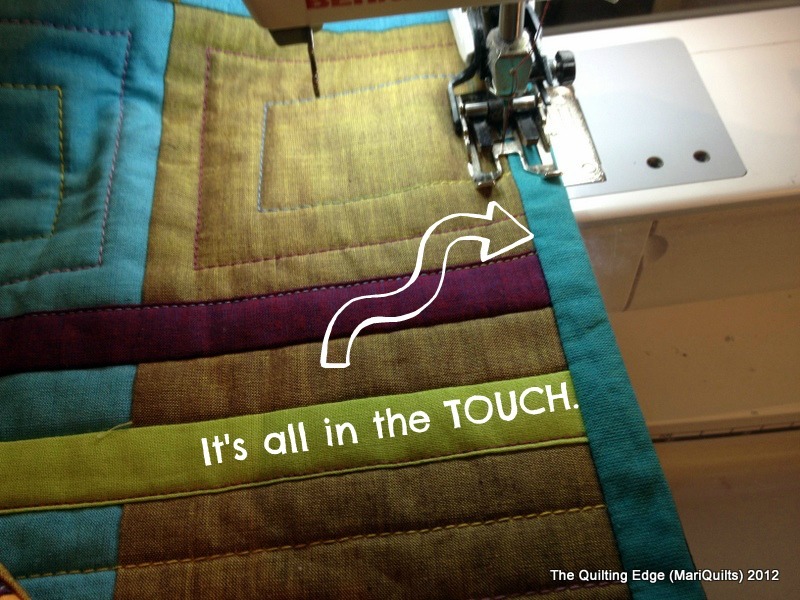 Remember to use your left finger, in the ditch as you sew, that way you can feel if you are catching the edge of the binding, as in this post. Stitch right to the corner, lift the presser foot and pivot. Put the presser foot down and resume sewing. In between doing this, I just took my Oakshott Quilt, out of the dryer.....pictures later. What's the most difficult thing about machine binding? I think it's the fact that you are sewing blind....you can't see if you are catching the binding as you sew, and who wants to use multiple pins that just seem to make matters worse. The answer is in the tips of your fingers...sort of like touch typing. This isn't a full on binding tutorial, but just a little tip that I read somewhere, that makes all the difference. When everything is pressed, including corners....something I don't do for hand-binding, I stitch in the ditch on the front of the quilt. As I'm slowly stitching, I run of tip of my finger (left hand), in the ditch....and trust me, you can feel the edge of binding on the back of the quilt. You can now feel what you are doing, with your fingers. For me this makes all the difference....give it a try, it might surprise you. When I first read this, I thought what????? Then I tried it and haven't done any hand-binding since. I don't know about you....I get lazy when it comes to labeling my quilts. Sharon Pederson in her book, More Reversible Quilts, has a nifty way of labeling and since I was already trying something new, with the reversible binding, I gave this a shot as well. You can put the info right onto the binding....how nifty is that!!! Now let's get this quilt clipped (you know all those pesky little threads that come from who knows where) and washed. So what does one do, when your perfect choice of binding isn't quite as perfect, for the back of your quilt? That is the case for my Oakshott Project. The front of the quilt is made up entirely, of shot cottons and the back is not. A reversible binding fits the bill....I hope. I've never done one before and thought...why not give it a try. So where does one find instructions for such a binding? 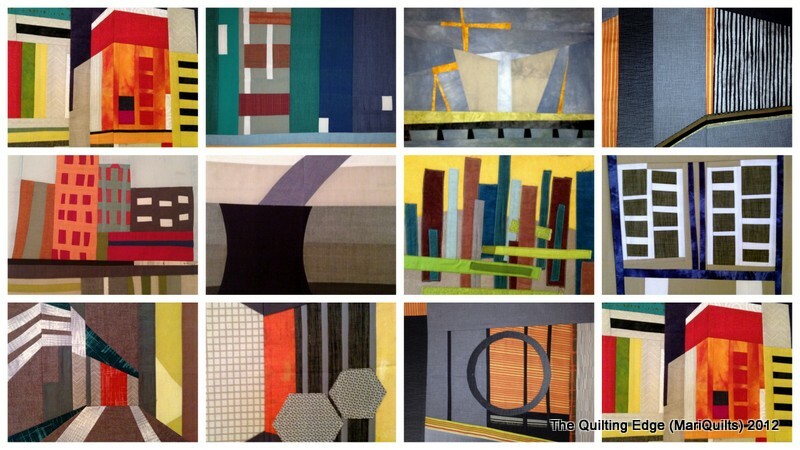 I just happen to have a copy of Sharon Pederson's book More Reversible Quilts and I reasoned...where there are reversible quilts, surely there are reversible bindings. And I was right. I cut enough binding for one side...just to test out this technique. Stitching the binding down, from the front of the quilt. This is a pretty nifty technique....I'll think I'll do the rest of the quilt this way.